Tank Details: 28 Gallon High. 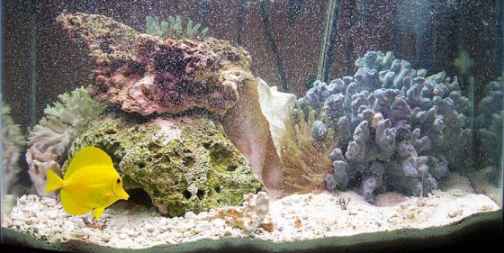 The Fish: Yellow Tang, Royal Gamma, Yellow tailed damsel, half banded damsel, Peppermint Shrimp, Arrow Crab, Coral Banded Shrimp, 2 Haitian Reef Anemone, 15lbs of Live Rock from Fiji. Comments: Two Bulbs one Coralife 10000K bulb the other a cool white standard aquarium bulb. Live Sand bottom, Outside whisper power filter, Protein Skimmer, 3 power heads for current and a heater.